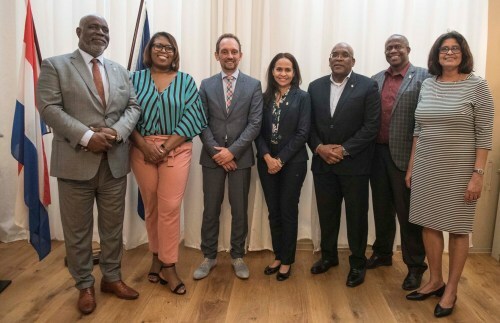 THE HAGUE - 'Team Curaçao', as Minister Plenipotentiary Anthony Begina introduced the Curacao Members of Parliament that participated this week in the Interparliamentary Kingdom Council (IpKo) and tonight, traditionally for a (well-attended) meet & greet was received at the Curaçao House. Giselle McWilliam, Ana-Maria Pauletta and William Millerson said they had a 'very busy week'. “We are working hard. We are doing everything we can to keep the flag of Curaçao high and to make agreements that are in the interest of the population,” according to McWilliam. Chairman Ruard Ganzevoort of the Senate Committee for Kingdom Relations confirmed it. Also present was Minister Hensley Koeiman who took the opportunity to argue that the countries of the Kingdom are making greater efforts to get to know each other better in order to prevent 'misunderstandings and unnecessary frictions'.